CaribSea has a new product that is just perfect for hobbyists in need of some live rock rubble. The Rubble Zone is box full of calcium carbonate based rock rubble that can be used to fill a refugium, as mounts for new frags, as building material for various fish (e.g. jawfish), and even as freshwater pond filtration material. Personally, we love to use rubble rock in the rear chambers of nano aquariums instead of those awful bioballs and ceramic rings. 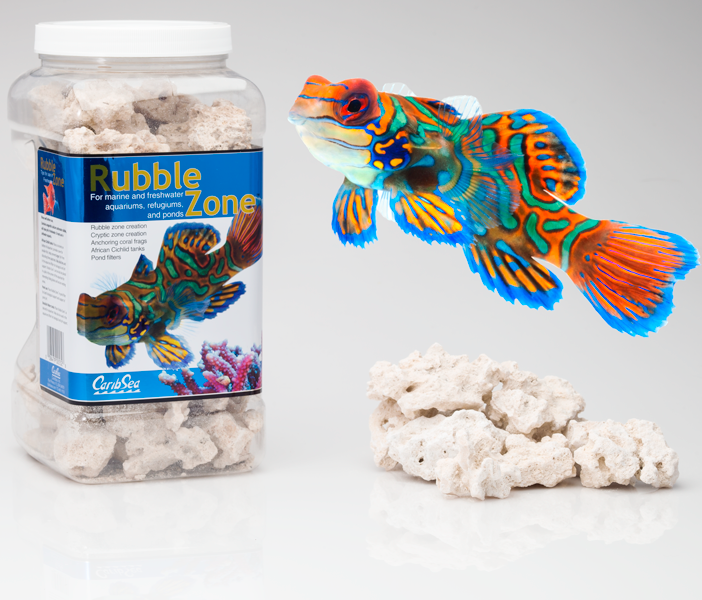 The Rubble Zone will be sold in one gallon boxes priced at $16.99 each, and they are available at online stores like Marine Depot. We can’t tell you how many times we’ve gone to the fish store or broken out a hammer and screwdriver just to get our hands on some live rock rubble. There are just so many uses, as it is the best and most natural material to use for things like coral fragging or creating hiding places in the tank for small creatures. We just aren’t sure why nobody has really thought of this before. Thanks to our pal Joe Savoy for inadvertently turning us on to this product. I agree. I like it porous nature! Lots of companies have had Rubble rock for years. like BulkReef Supply and SaltCritters and Premium Aquatics.